Once again, Fountain UB (Keyser, W. Va.) is serving as the collection site for the county’s Operation Christmas Child. In 2008, they collected 9100 shoeboxes full of small gifts, which were then distributed by Samaritan’s Purse to children in under-developed countries. This year’s goal is 12,000 boxes. 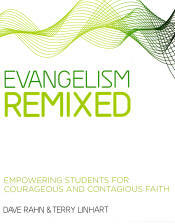 Dr. Dave Rahn, who teaches youth ministry at Huntington University, has co-authored a new book: “Evangelism Remixed: Empowering Students for Courageous and Contagious Faith.” It’ll be released July 1. He co-authored the book with Dr. Terry Linhart of Bethel College. It’ll be available through Amazon. Doug and Ruth Weber and family, UB endorsed missionaries in Ecuador with HCJB Radio, are spending the summer in the States. A week before they returned, Ruth’s stepmother, Jean, passed away. They flew to California for the funeral, and will return to Indiana today, June 30. Good Morning America ran a “Your Three Words” video collage which included Polly Dunten and her three children. They are the very last clip. It begins with a photo used in a “Your Three Words” segment last summer, after Polly’s surgery to remove a brain tumor. Husband Darwin Dunten is pastor of First UB church in Findlay, Ohio. A UB medical team arrived back from a ten-day trip to Honduras on June 27, one day before Honduran President Manuel Zelaya was deposed in a military coup. The Honduran Congress has already appointed a new president. A nationwide curfew from 9 pm to 6 am is in effect for June 29-30, but the country seems to be at peace, at least in the immediate aftermath. The coup happened on the same day that Hondurans were voting on a proposal which would enable President Manual Zelaya to seek re-election. The country’s Supreme Court had declared the referendum illegal. The coup has been widely condemned, with statements to that effect coming from both the United States and Venezuelan President Hugo Chavez. A military coup occurred in Honduras on Sunday, June 28. Sharon had not been feeling well for several days before Troy’s dad passed away unexpectedly. She continued to worsen and became quite jaundiced, and Sunday was admitted to the hospital for what we thought/hoped was gallstones. Yesterday morning the doctors did a procedure with a scope to try to move the stones, but found no stones. However, the (bile?) duct was 100% blocked by something. In the afternoon they did another procedure to insert a drainage tube in the liver, to drain the bile that had been backing up in her system. They will be doing more tests to determine both what the blockage is, and exactly where it is located, but are concerned with it’s location near/on the liver. As you might imagine, so much has happened with Troy’s father’s unexpected death, and now with his mother’s illness in such a short time that I don’t think any of us are able to process the information. We are just doing what needs to be done at the moment. We have cancelled our return flight to Spain that was scheduled for tomorrow (Thursday), and will determine a return date once we know more about what is actually going on with Troy’s mom. We completed tabulating all the evaluations from the US National Conference. People were asked to rate various aspects of XLR8 on a scale of 1-10, with “Poor” on the low end and “Great” on the high end. When people circled “Great,” we gave them an 11. That’s why you see scores above 10. On that note: way to be, children’s and teen workers! You were obviously deeply appreciated. The lowest scores went to the business session (no real surprise there), and music (music is a huge point of disagreement in local churches, so you would expect the same at a national church conference). When I went to Mainstreet, the church had been on a steady decline for several years, going from 330 people to 220. The worship service was so structured that if you went in at 11:10 any time of the year, they would be doing the same thing. If they did the responsive reading at 11:10, that’s where they did it every Sunday. The preacher quit at 11:30 whether he was done or not. They groused about it, but they complied. Because the new guy said so. They had been doing things one way. I took them into the neutral zone. But what I wanted was to get to the point where we didn’t have a choir at all. That’s not something you pull off overnight. But in time, we got there. Ed Mast passed into eternity Monday morning, June 22, in Arizona, where he and his wife, Mary, had lived since the early 1970s. He is survived by his wife Mary, children Sandi McMahon, Sue Copp and Randy Mast, plus a number of grandchildren and at lest one grandchild. Visitation: Wednesday, June 24, 6-8 p.m.
Funeral: Wednesday, June 24, at noon. Location: Green Acres Mortuary, 401 N Hayden Road, Scottsdale, AZ 85257. Ed Mast pastored the UB church in Glendale, Calif., for many years. In the mid-1970s, he moved to Fountain Hills, Ariz., where he started what is now Fountain Hills Community Church.